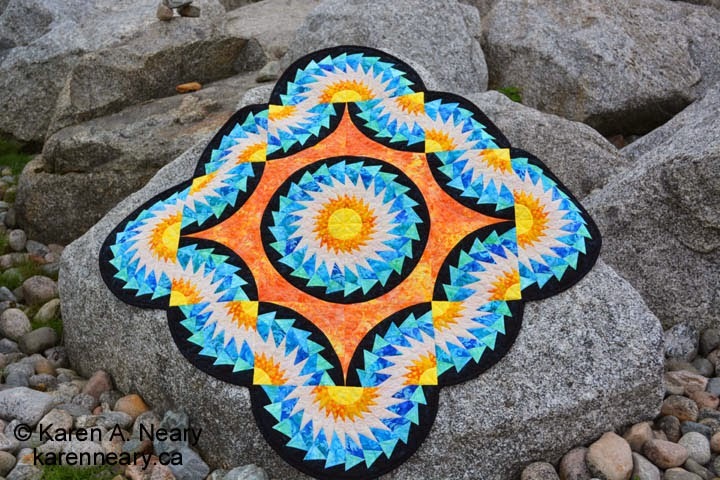 Awhile back, pattern tester Darlene Gerber worked on my Roundabout Again pattern before it went to print. 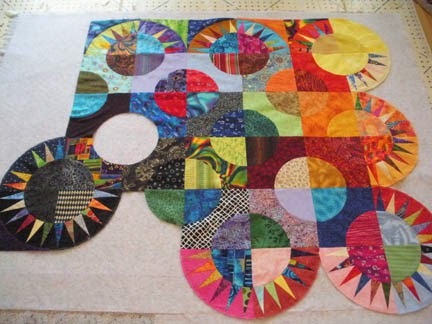 She finished the top in no time, but didn't get around to the quilting. 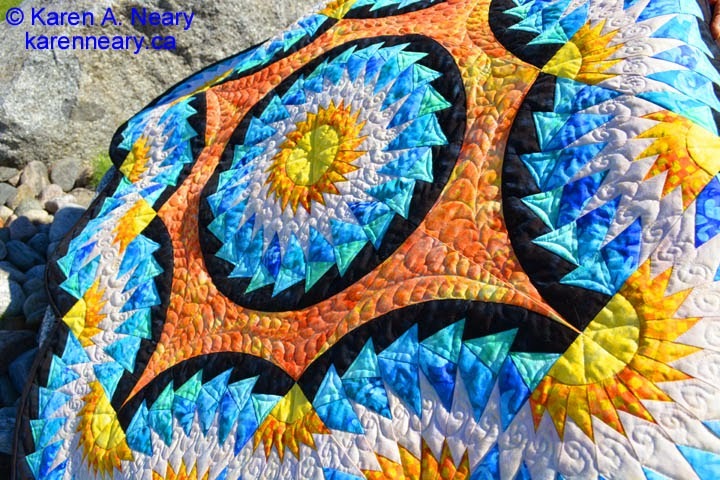 She sent it out to award winning quilter Valerie Smith, aka The Pumpkin Patch Quilter. 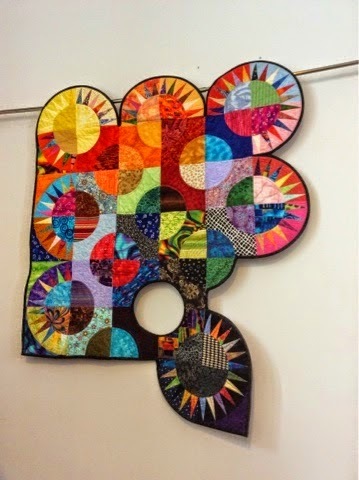 You've got to visit Valerie's site to see this piece - her quilting is jaw-dropping phenomenal. The curved cross-hatching is so effective in the quarter circles, and those feathers in the middle - oh my! 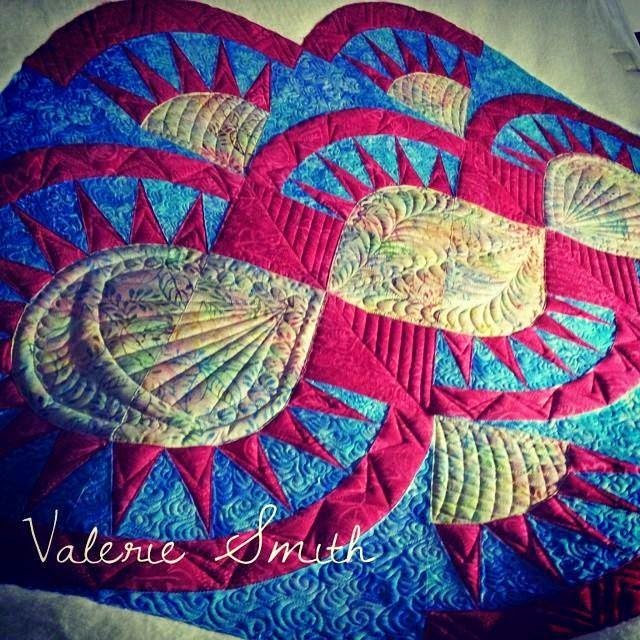 Click the Quilt Gallery tab at the top of Valerie's page to see more. Wow! 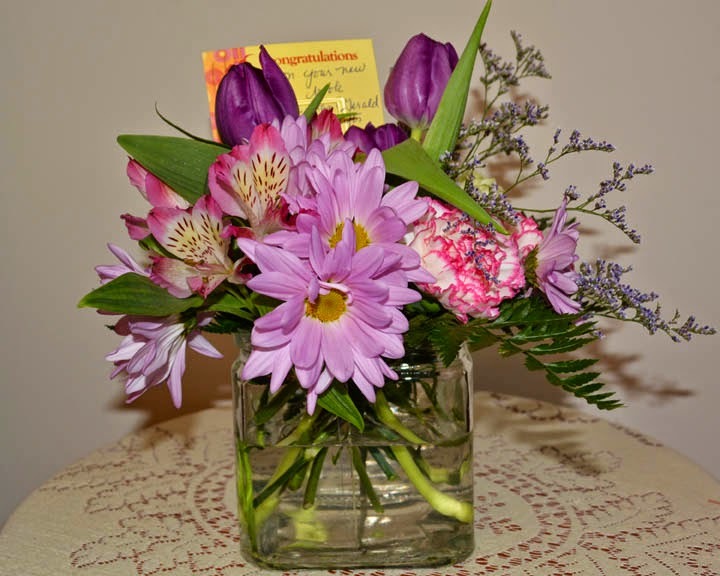 Please be sure to leave Valerie a comment so she knows you have visited. 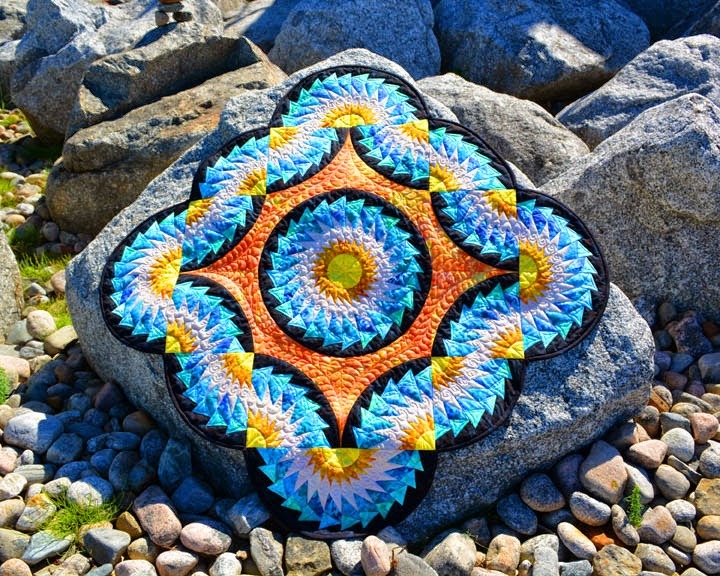 I know you will enjoy seeing her beautiful work - I sure did! For as long as I can remember, I have wanted to participate in the Hoffman Challenge. Lo and behold, Mrs. Pugsley's Emporium stocked the required fabrics for the 2015 event. 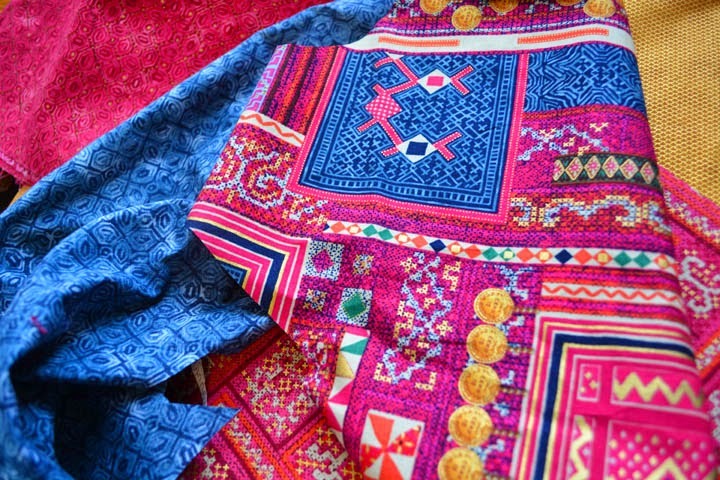 How awesome; it takes one off the old bucket list...The fabric collection is called Mandalay; the one on top below is the main one to be used. Gold and pomegranate. The rules are quite flexible so I paired a couple of other Hoffman prints with the line, which added both silver and gold sparkle. One of the sponsors of the challenge is Aurifil Thread so I ordered some from Bytowne Threads to use in the piecing and quilting. The deadline is very generous and the completed project is not due until July so I have lots of time to enjoy the process. Yesterday we finally got our street widened from the last big snowfall to two lanes and this morning we woke to...more snow, more school and business cancellations, and more shoveling! The mailman has only made it here once since last Thursday and when he did, he brought a lovely surprise. It's a copy of my book, signed by all the wonderful folks from AQS who had a hand in it. 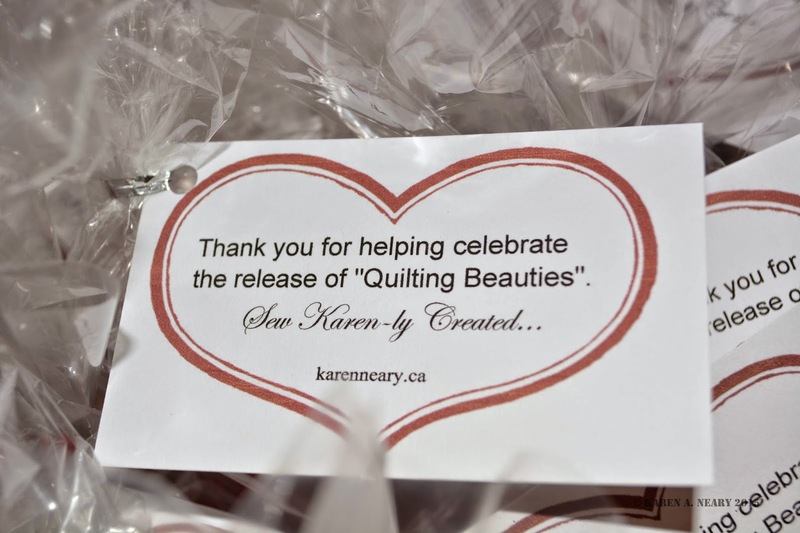 What a special keepsake, and such a thoughtful gesture on the publisher's part. The details are here, on Grandma Coco's blog. Have fun! 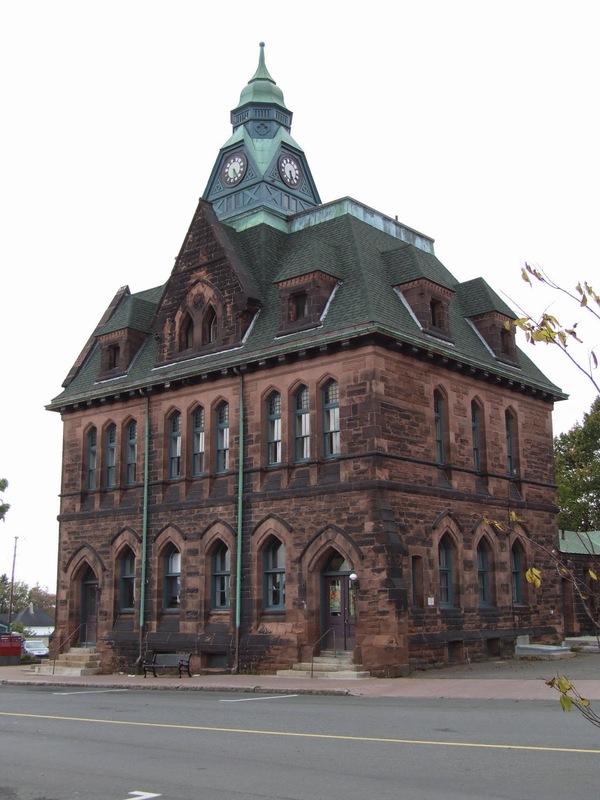 Amidst all of the snow, here's a lovely version of Meadow Song by Mary Farrow-Sinclair of Amherst to make us think of spring. 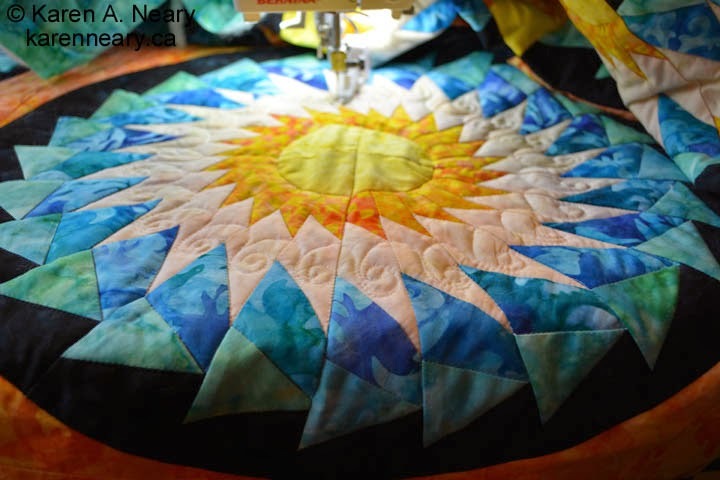 If you click on the picture, you should be able to see the cross-hatch quilting Mary has worked in the background of the appliqués. It sets the motifs off so nicely and gives a traditional look to the piece. 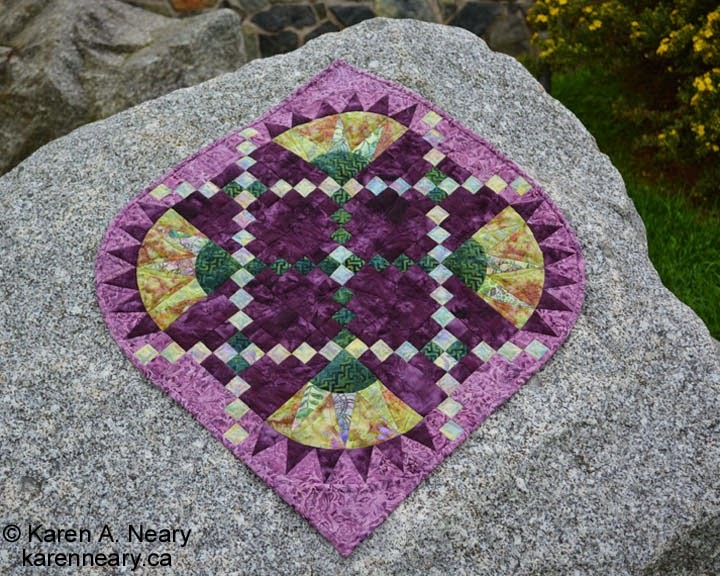 You can see that my version used a few more pinwheels than Mary's, but she has substituted plain blocks for her border very effectively. 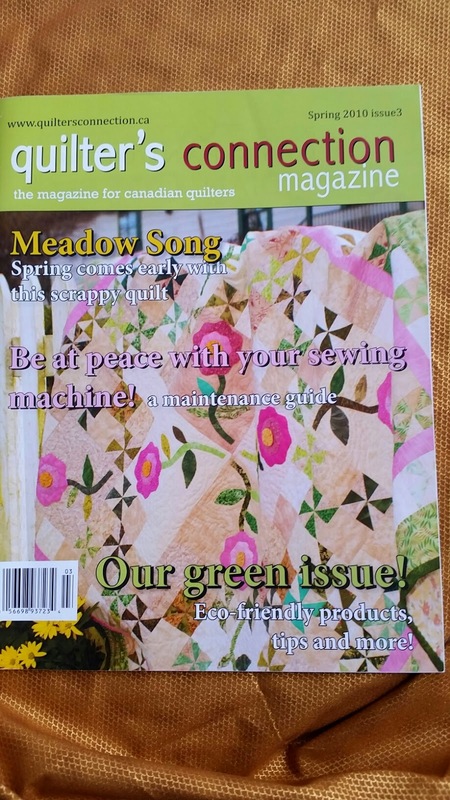 Meadow Song appeared on the cover of Quilter's Connection magazine. 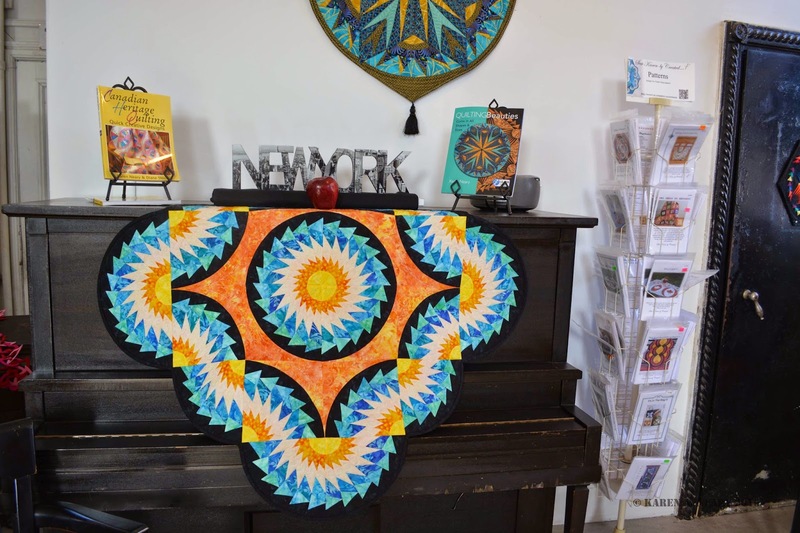 Mary is one of the members of Amherst's Train Station Gallery and with this quilt she was chosen to be the Featured Artisan. Congrats, Mary, on a beautiful piece of work. 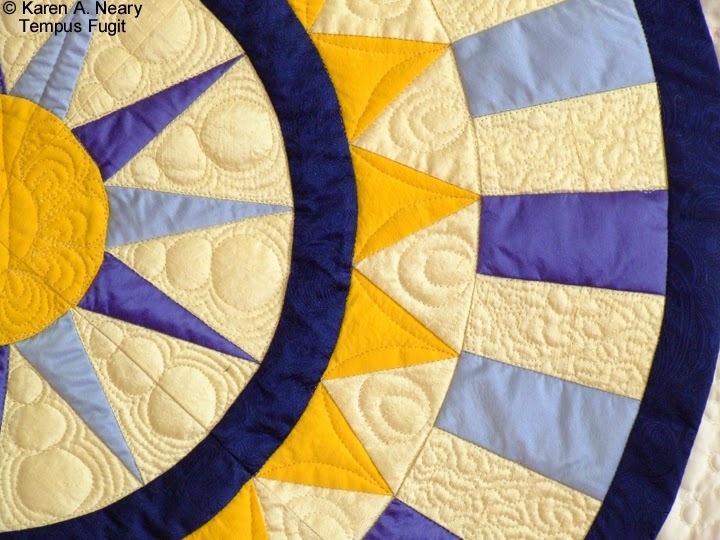 If you are interested in purchasing Mary's quilt, you can contact her here. 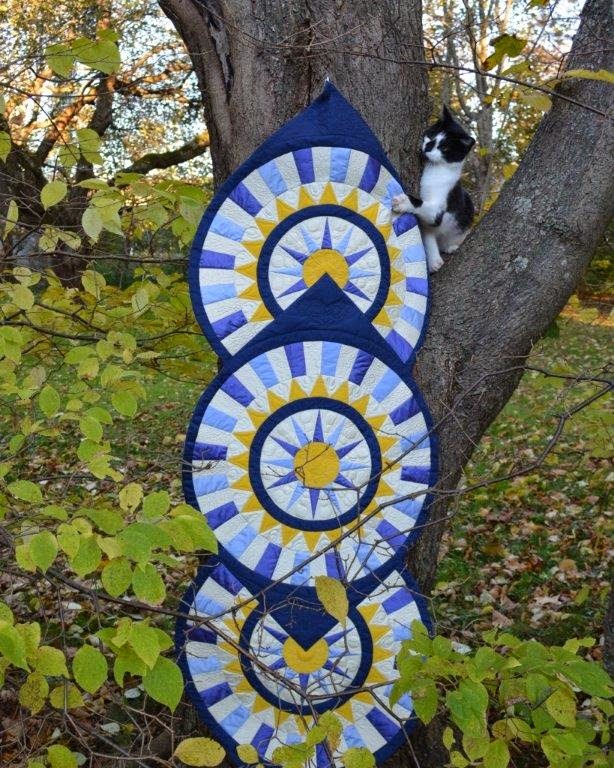 The pattern for Meadow Song is available on Craftsy as an instant download, or in print version from Mrs. Pugsley's Emporium. 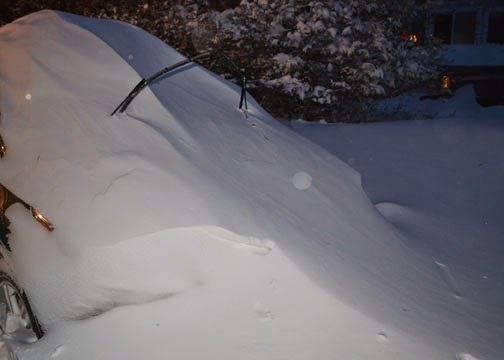 We got a bit of snow last night. 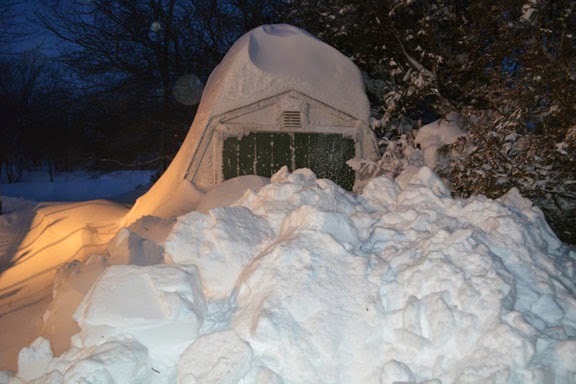 According to CTV News, Amherst took top spot in the snowfall, with 65 cm down so far! 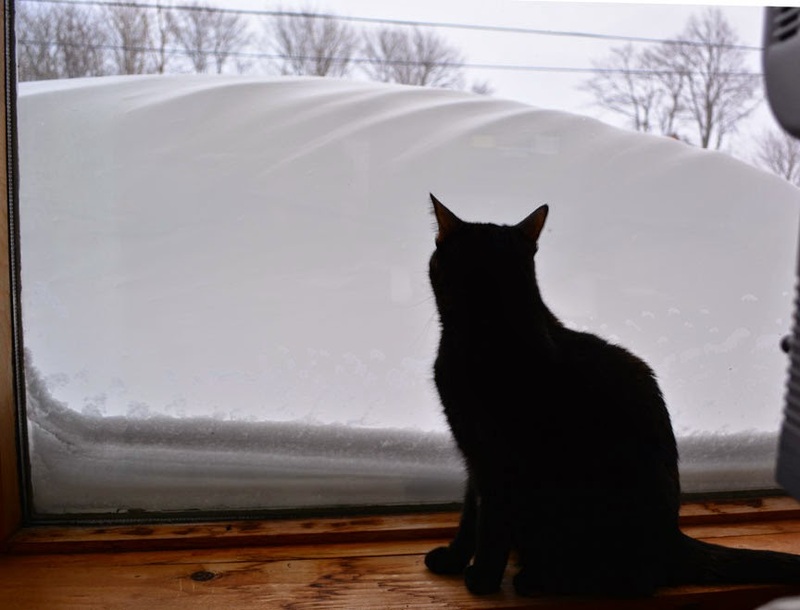 It's going to be awhile before the car is dug out. Polly is not a bit impressed with the view from the living room window. 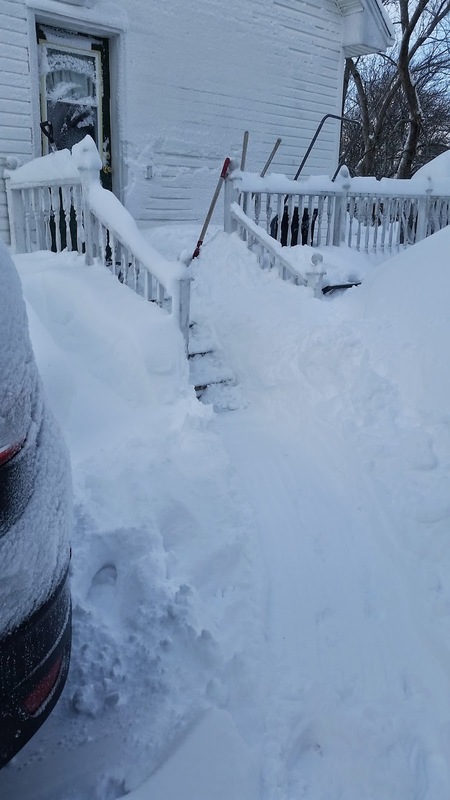 This is the amount of snow on our front walk. 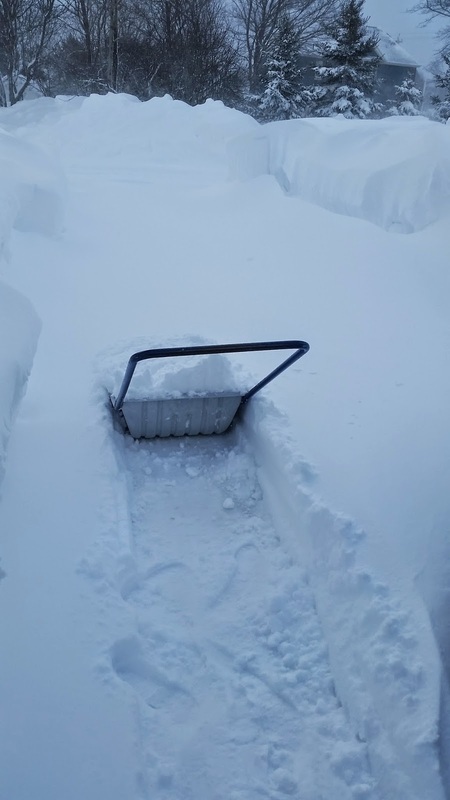 Hubby has suggested it would be easier to move the mailbox than to clear the walk! 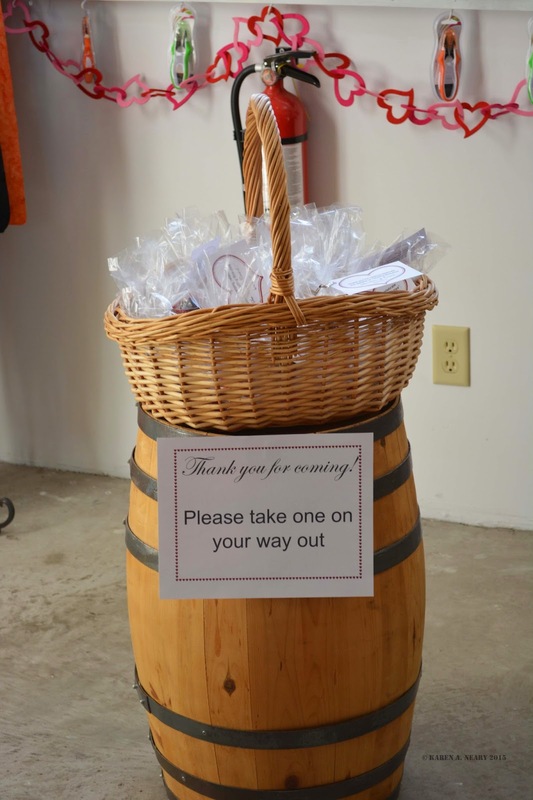 Thanks SO MUCH to everyone who came yesterday to Mrs. Pugsley's Emporium. It was a great party. There was no time for pictures once things got rolling, but here are a few from just before the shop opened. 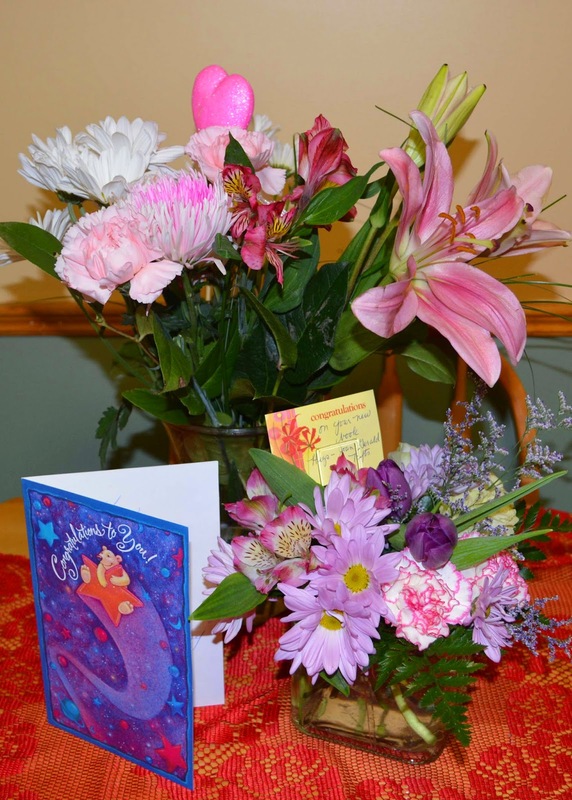 There was also a delivery of flowers from Joan and Gerald unable to attend because of today's blizzard. How sweet, and how very Joan. Everyone in the shop waited as I read the card read to see who the mystery sender was. Thank you Joan and Gerald for adding to the day's fun! There were little bites of NY style cheesecake to go home with each visitor, and of course a little chocolate in honour of the day. Sincere thanks to all who attended in person, and in spirit. It was a lovely day. Thank you Beth! GORGEOUS fabrics were supplied by Hoffman of California, Stof of Denmark and Michael Miller Fabrics. The very creative Mark Hordyszynski also had a hand in this. Mistakes are so easy to make when writing instructions - an "off" day of keyboarding might give a measurement listing as 12" instead of 1/2" so it was vital to enlist sharp eyes to watch my back. 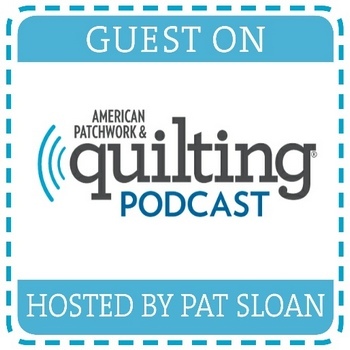 I am grateful for the assistance of professional pattern testers Lynn Bourgeois of River Philip, Nova Scotia, Darlene Gerber of Geneva, Ohio and Kari Lippert of Hanover, Maryland. These experienced quilters went over and over the instructions with a fine tooth comb and I feel confident that nothing was missed. It was great to have my friend Lynn on the testing team again, as she and I go back a long way. 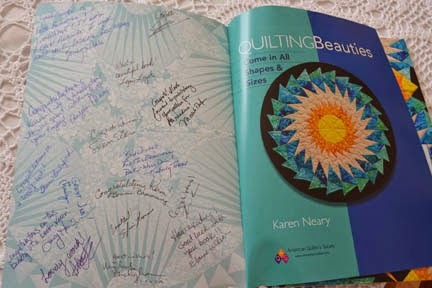 Lynn had also helped out on the first book, Canadian Heritage Quilting. They say the place of honour is at the back of the book, and I am thrilled that two members of La Guilde Acadienne de Clare here in Nova Scotia, Alisa Aymar of Meteghan and Joan Tufts of Saulnierville, contributed photos of their work for the Gallery section. 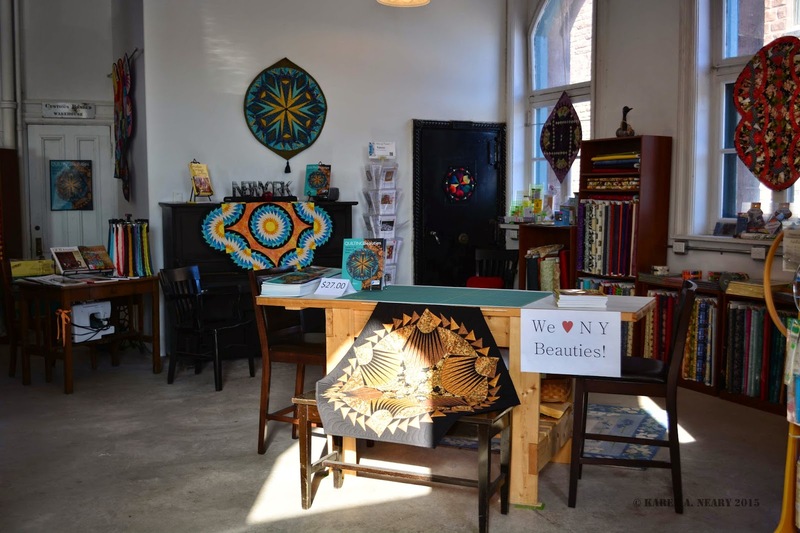 Make sure you check out their beautiful quilts! 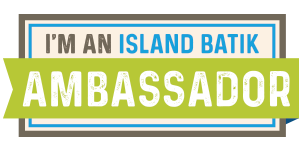 I am indebted to so many for all the help on this project, and I thank everyone involved. Beth Munroe's enthusiasm from the get-go has been so awesome. She invited me down to meet with the fabric reps visiting her quilt shop so that I could see and feel the new collections first-hand. She gave away a trip for 2 to New York City to promote the book, and she is hosting the signing tomorrow at her shop. 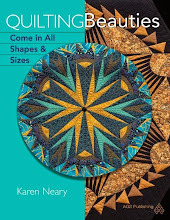 Come join us if you can - 10 to 2 - and see for yourself that Quilting Beauties Come In All Shapes and Sizes. 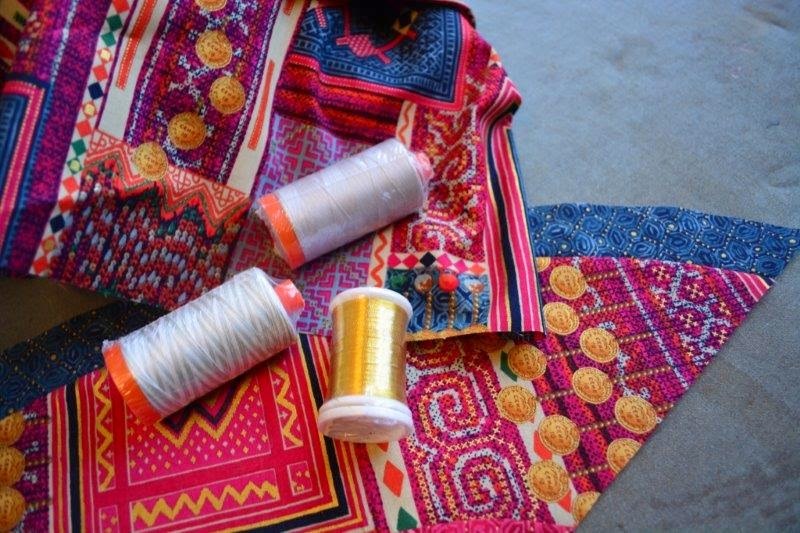 Batik Beauty - the name says it all! 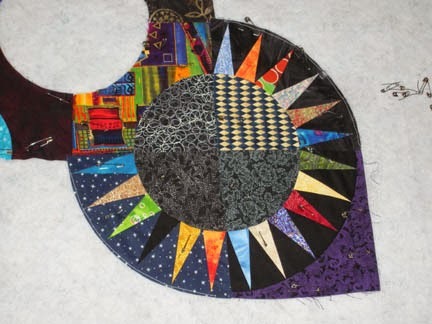 This quilt was stitched using batiks from Michael Miller. I love the bright clear colours in their batiks. The black is actually not a solid; when you get close you can see it mottled with dark blue streaks which was perfect in this quilt. 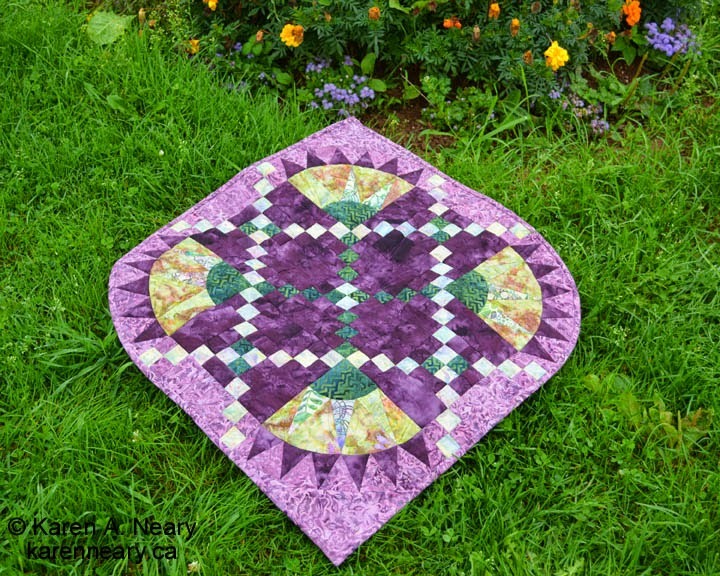 To show the quilting, I did the unpardonable in the photography world and shot some pictures outside on a very bright, sunny day. Yes, it distorts the colours, but the relief of the stitching stands out very clearly. 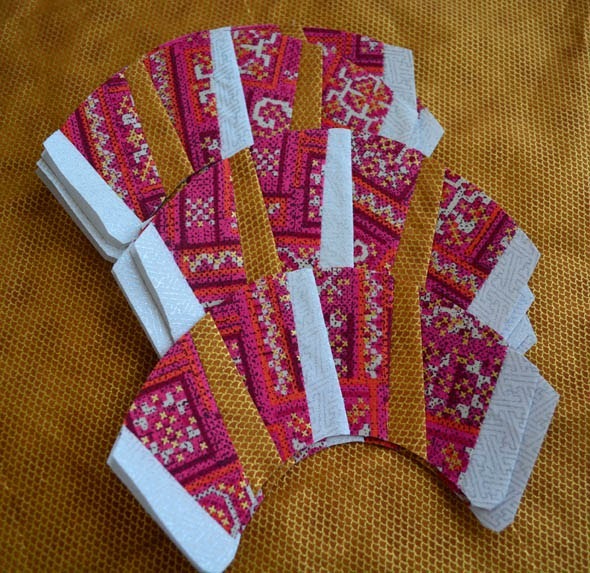 The centre orange section is filled with feathers, and little scrolls swirl around the cream band which circles the centre. The pictures were taken at the Nova Scotia/New Brunswick border, where there is a small lighthouse surrounded by these very handy rocks. 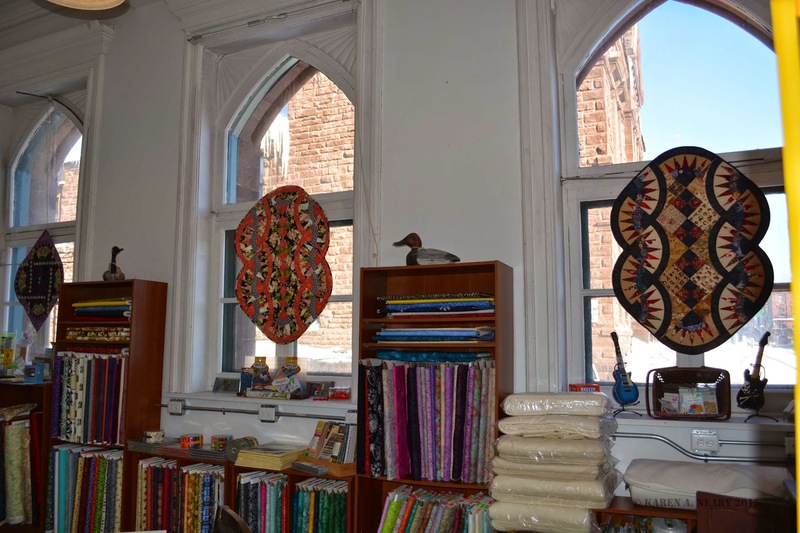 I take a lot of quilts over there to photograph. 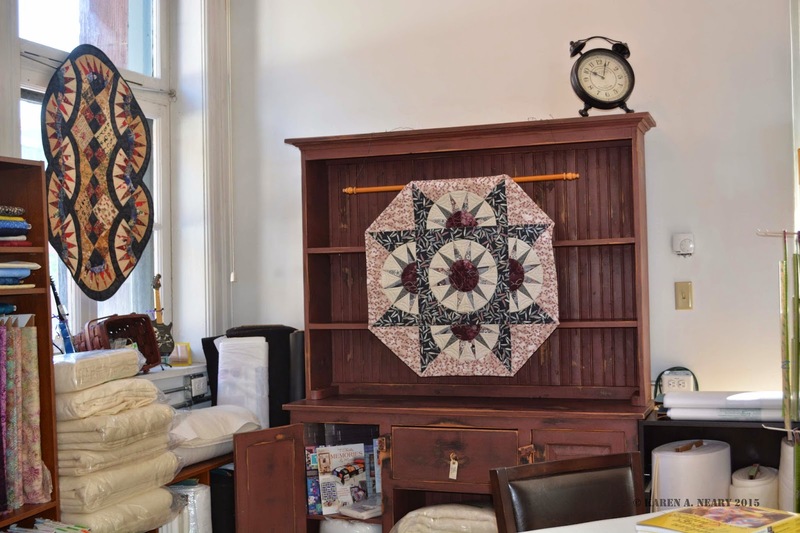 At Mrs. Pugsley's Emporium, this Batik Beauty is displayed on an antique player piano made from a dark wood; the quilt looks fabulous in that setting. Come and see for yourself! This one is all about fun. 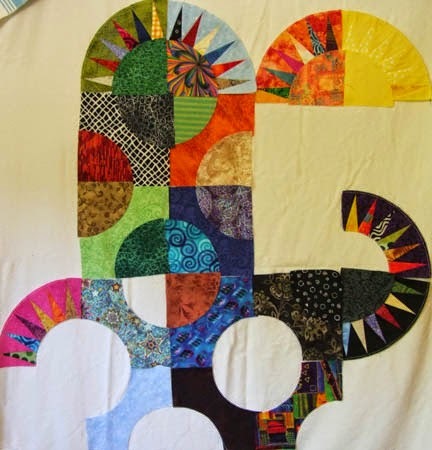 It is named Calliope because it makes me think of circus music when I look at the playful blips and dips in the quilt. It was more fun than a barrel of monkeys as it grew on the design wall. I chose bright colours randomly for the spikes. The only constant was that the arc background in each block was kept the same. Pieces were auditioned in several different arrangements before I settled on one I liked. At this point I decided I really liked that hole and it was going to stay! It's like a black hole in a galaxy of stars...and one sun. Here is Calliope laid out for basting. I used a polyester low loft batting...simply because that's what I had on hand at the time. This piece was put together very quickly as I wanted it for display at an upcoming workshop on a New York Beauty design. Calliope turned out to be a bigger hit than the workshop project and hogged all the attention that day! 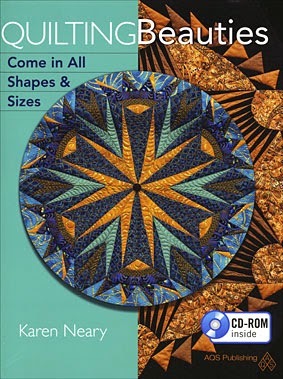 The directions in the book show how the opening is finished, and also gives tips on how to hang this oddly shaped quilt. It's easier than you think; it just takes a little ingenuity. 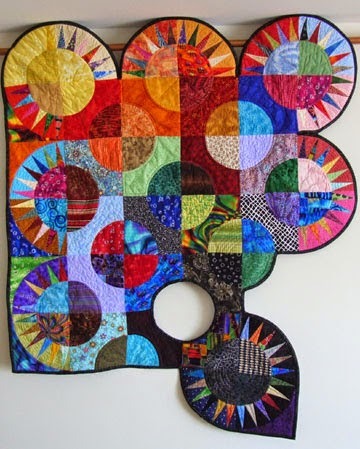 Each section is quilted differently. 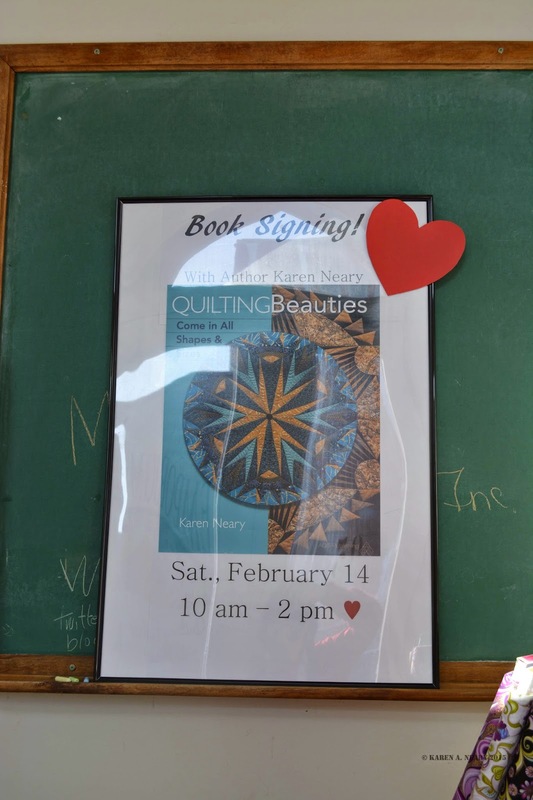 Here's a shot I snitched from Mrs. P's blog, showing Calliope hanging at her shop in preparation for Saturday's signing. 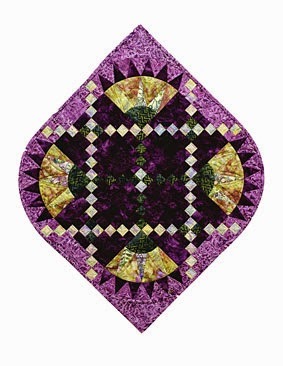 Here's Tempus Fugit, from the book Quilting Beauties; it is pieced in silk. I love working with silk, and it was not a bit difficult to sew this fabric into a New York Beauty . The design reminds me of a clock face so I chose to name this Tempus Fugit which is Latin for "time flies". 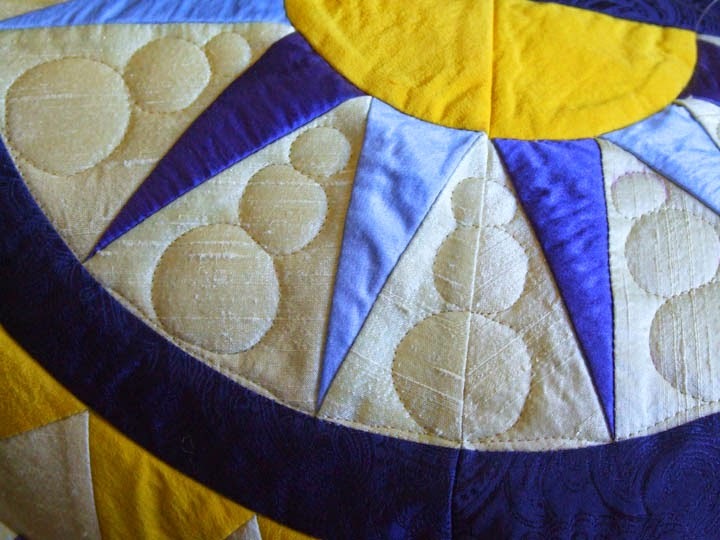 The quilting between the spikes is three graduated circles. 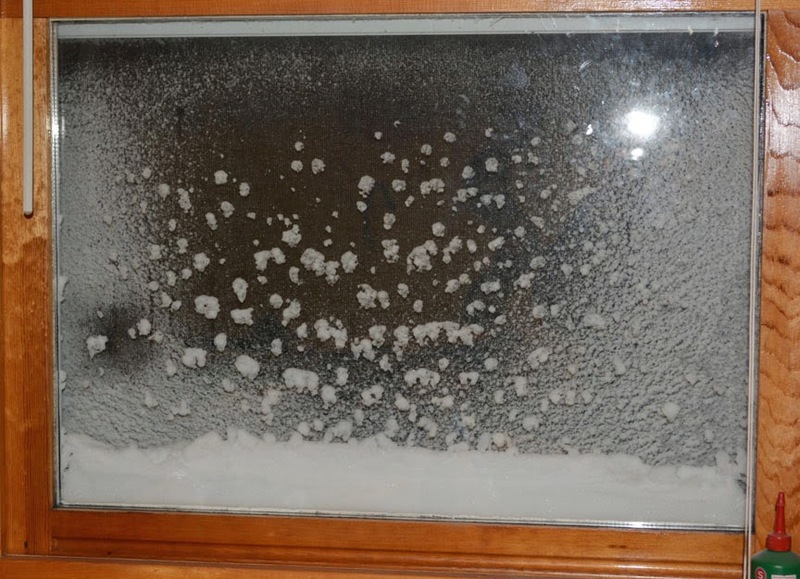 Perhaps because of all the weather we've had lately, all I can see now are snowmen (!) 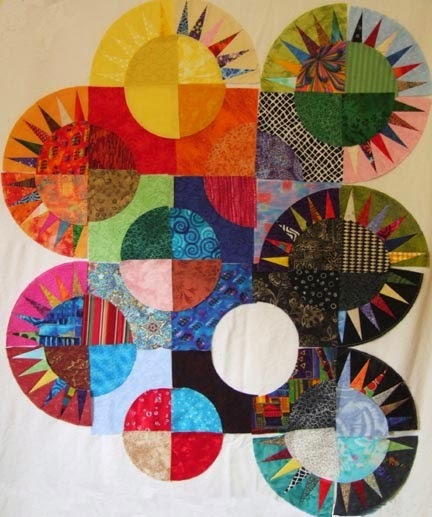 but it was a fun motif to quilt. Over the years I have acquired quite a silk stash and it's always a special treat to be able to use from it. There are four shades of blue silk habotai used, from very light to navy, as well as yellow and cream dupioni. 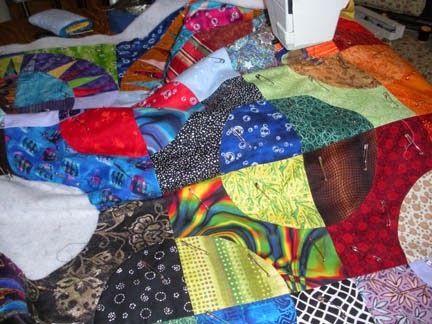 Both the piecing and quilting were done using Invisifil thread, which is a very fine (100 weight) cottonized polyester. 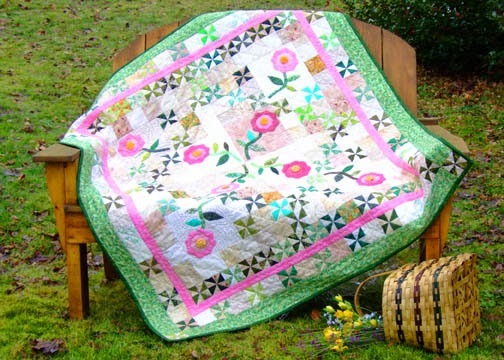 The quilt has a single layer of wool batting and is as light as a feather. It hangs from a tiny ring at the top. 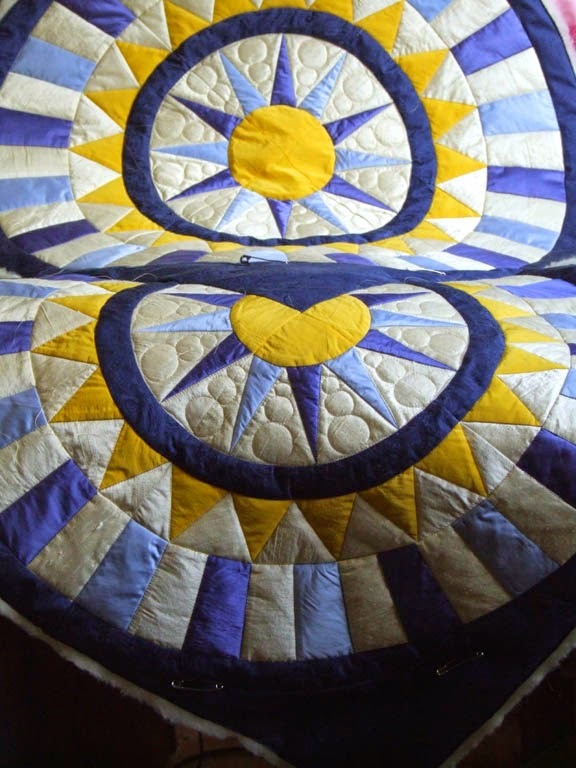 One of the unique aspects of this quilt is that the outside edge is not bound, it is faced. I've included instructions in the book on how you can easily do this for a neat and clean finish to the outer edge. His Cuteness was present, as always, to help with the photo shoot. 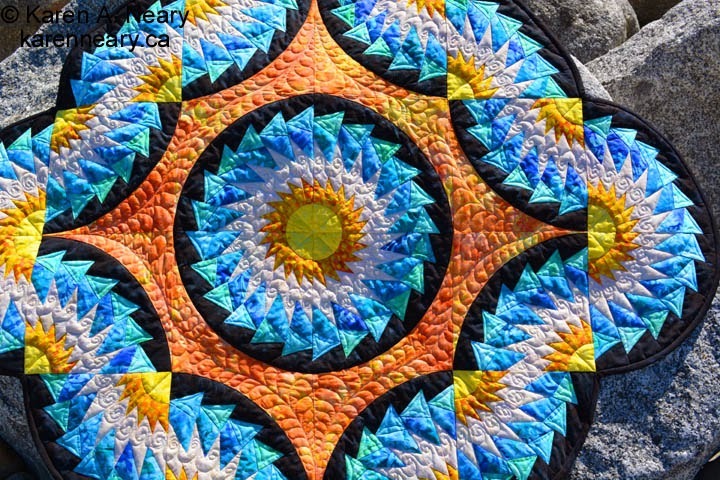 Tempus Fugit was part of the National Juried Show at Quilt Canada one year. 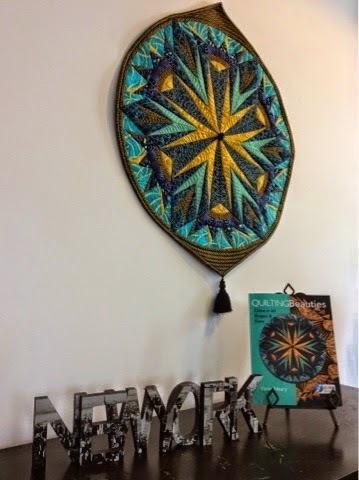 Along with Arabesque, it has been selected by AQS to travel around to exhibit at their quilt week shows this year so it will not be part of the display at Mrs. Pugsley's Emporium for the signing on Feb. 14.